Sun Wukong, the Handsome Monkey King, is one of the most famous figures in Chinese literature. He is one of the main characters in Journey To The West (西游记, xī yóu jì), an epic novel written in the 16th Century by Wu Cheng’en. Journey To The West is loosely based on an actual journey by the Buddhist monk Xuanzang, who traveled from the Chinese city of Chang’an westward to India in 629 A.D. and returned 17 years later with priceless knowledge and texts of Buddhism. Over the course of the book Xuanzang and his companions face the 81 tribulations that Xuanzang had to endure to attain Buddhahood. Each book in our Journey to the West series covers a short section of this epic story. In our first story, The Rise of the Monkey King, we introduced Sun Wukong and covered the events in the first two chapters: we learned how the little stone monkey was born, became king of his troop of monkeys, left his home to pursue enlightenment, received the name Sun Wukong (literally, “ape seeking the void”) from his teacher, and returned home to defend his subjects from a ravenous monster. In this book, the second story in our Journey to the West series, we cover the events of chapters 3 and 4 in the original epic. Things begin to unravel for Sun Wukong, as he starts to see the consequences of his outrageous actions. While trying to defend his troop of monkeys, he manages to offend the underwater Dragon King, the Dragon King’s mother, all ten Kings of the Underworld, and the great Jade Emperor himself. Finally, goaded by a couple of troublemaking demons, he goes too far, calling himself the Great Sage Equal to Heaven and setting events in motion that will cause him some serious trouble. These stories are all written in simple language suitable for beginning Chinese learners at the 600-word HSK 3 level. Whenever we introduce a word or phrase that isn’t part of HSK 3 and was not already defined in Book 1, it’s defined in a footnote on the page where it first appears. In order to reduce the number of footnotes we also list, in the next section, all the new words that were already introduced in Book 1 and used again here. In the main body of the book, each page of Chinese characters is matched with a facing page of pinyin. This is unusual for Chinese novels but we feel it’s important. 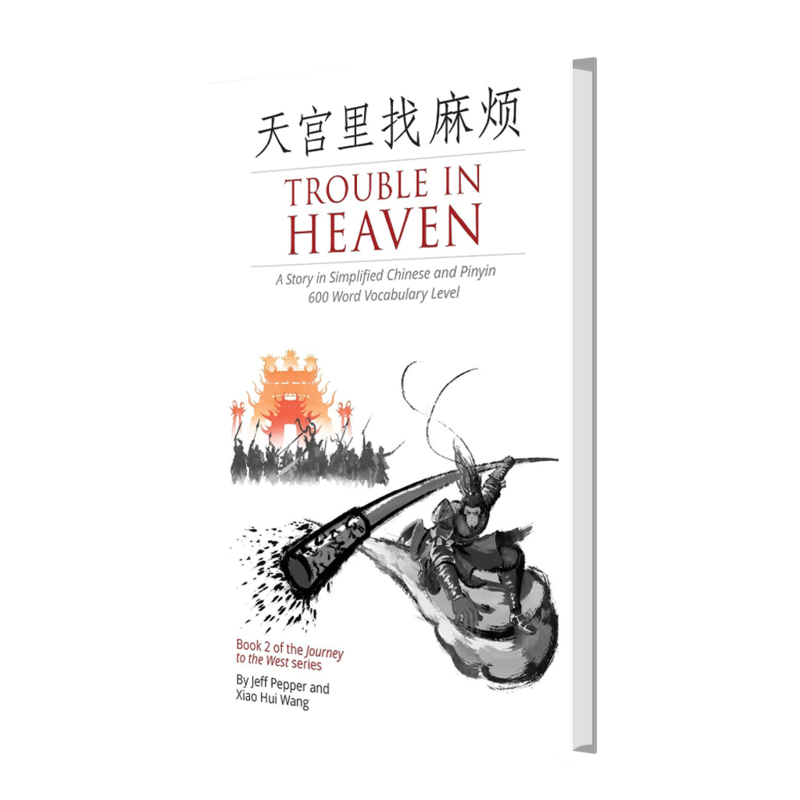 By including the pinyin, as well as a full English version and glossary at the end, we hope that every reader, no matter what level of mastery they have of the Chinese language, will be able to understand and enjoy the story we tell here. We hope you like this book, and we’d love to hear from you! Write us at info@imagin8press.com.